Saturday, September 20, I left Cordova just after dawn on the same small, twin-prop plane that brought me here. The weather seemed to have broken, and we had a pleasant and scenic flight to Anchorage. I rented a car and drove around town, ending up at the Glacier Brewhouse where I treated myself to some king crab legs – one culinary goal I had while in Alaska. It was delicious, if a bit pricey. 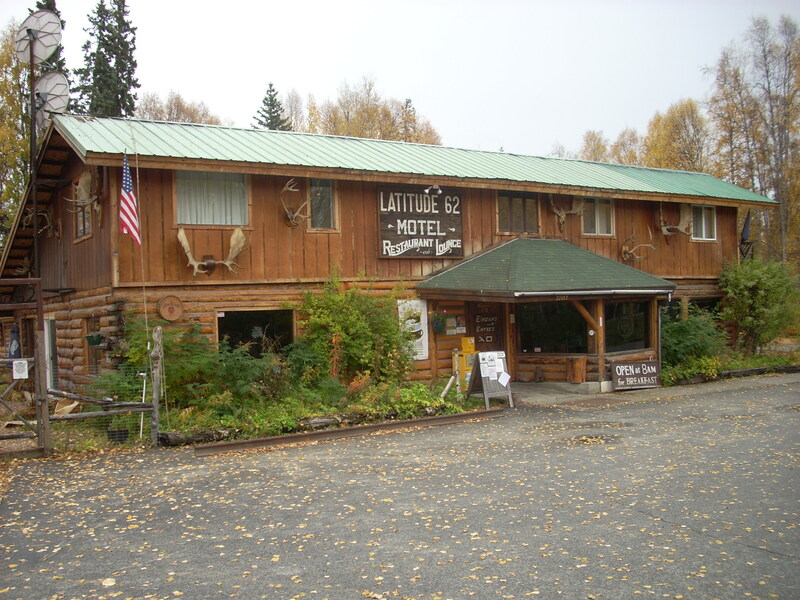 I eventually headed north toward Talkeetna, where I was scheduled to play at a place called Latitude 62. As I journeyed out, however, I got the message that the town had been evacuated due to flooding! The gig was cancelled. A woman named Dottie Leonard offered to host an impromptu house concert, however, since she lived on higher ground. I was already underway and had no other plans or place to go, so I decided to take my chances and drive north. 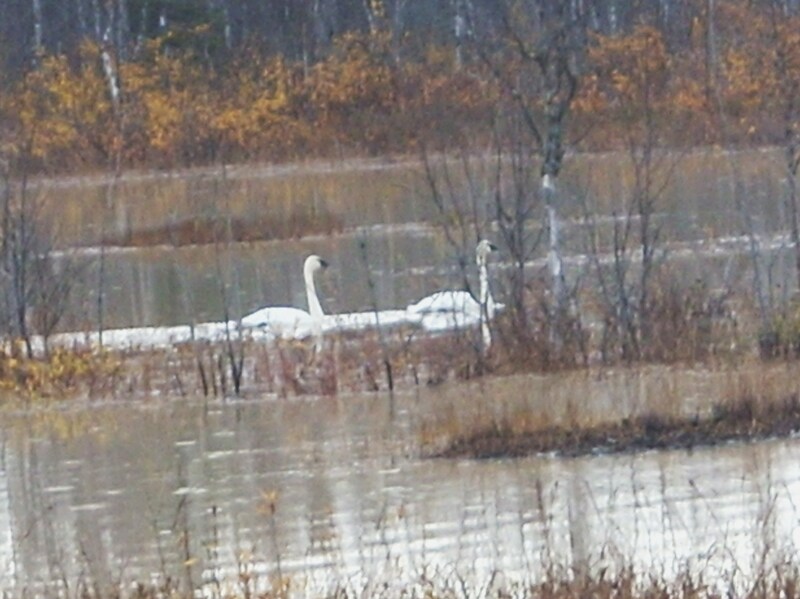 The further north I drove, the more high water I encountered. This stream was nearly over the bridge. Water partially blocked the highway in several places, and I began to question the wisdom of this adventure. But I drove on. Water concerns aside, it was an interesting and beautiful drive. I was curious to stop in Wasilla, the home of Sarah Palin, hoping to find a postcard or tee-shirt or something about seeing Russia from here, but no luck. 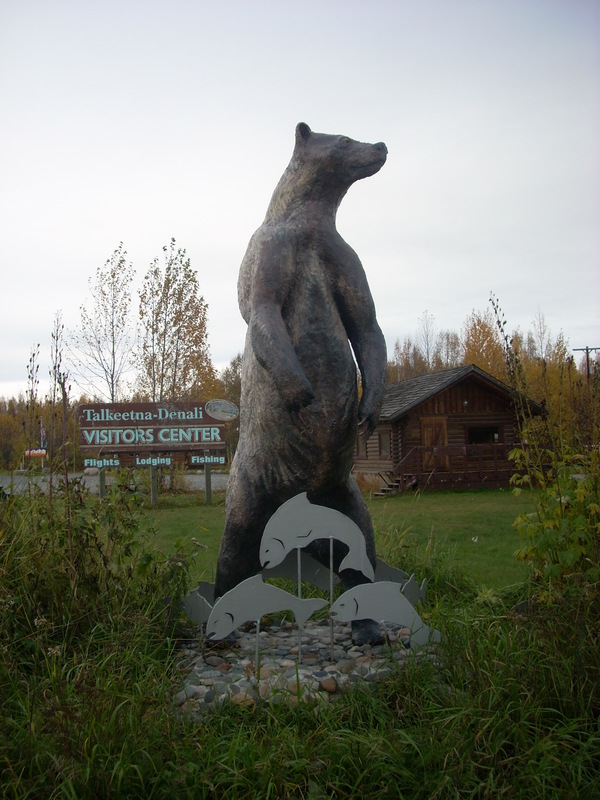 I eventually came to the Talkeetna/Denali turnoff. There is only one road heading north out of Anchorage, connecting it to Fairbanks. And intersections are few and far between. 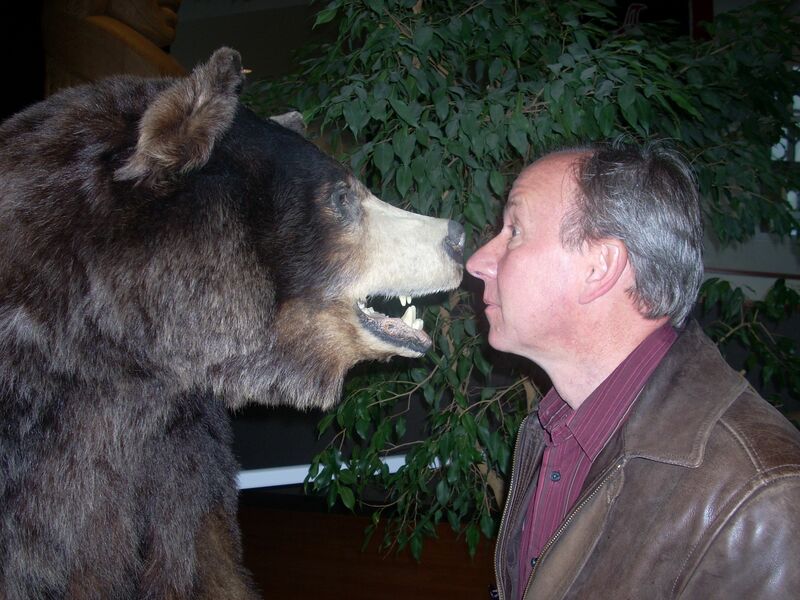 This bear sculpture served as the welcoming committee. A police blockade along this road attempted to deter me. I lied and told the highway patrolman I didn’t plan to stay long. I’d come too far to turn back now! I made my way to Latitude 62, where I had planned to meet Dottie and follow her up to where the house concert would take place. Dottie showed up in a pickup truck driven by Nancy Tucker, the owner of Latitude 62. Nancy unlocked the door, we walked inside, a bartender appeared, customers started wandering in, and Latitude 62 was back in business. Flood be damned! We set up a P.A. system and I sang for two hours without a break. Great time! and two teams of sled dogs. They train the dogs with ATV’s, in preparation for the winter. 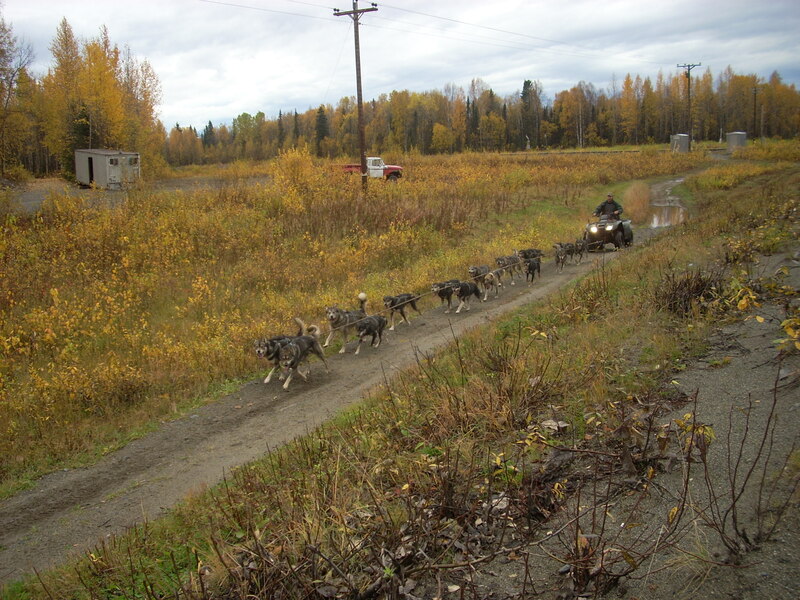 This is Iditarod country, and they take their mushing seriously! I eventually made my way to Chugiak, on the outskirts of Anchorage, and the home of Robin and Bruce Hopper – my hosts for tonight’s house concert. The concert went very well. I had sold out of all my Cold Comfort and Live at Red Barn Radio CD’s, so I rewrote my set list to feature songs from Haunted Honky Tonk. The audience was wonderful! Great singers, mostly musicians. It was Robin’s birthday, so we sang for her. She reciprocated by singing a very entertaining Alaska version of “I’ve Been Everywhere.” I stayed with Mike and Katy McCormick. On Sunday morning, my old buddy Brian DeMarcus, a former Green Grass Clogger, met us for breakfast. Brian took me for one last sightseeing excursion before I caught the red-eye back to West Virginia later that day. Here is a parting shot from a truly indelible trip to Alaska! Oh, the Wind and Rain! 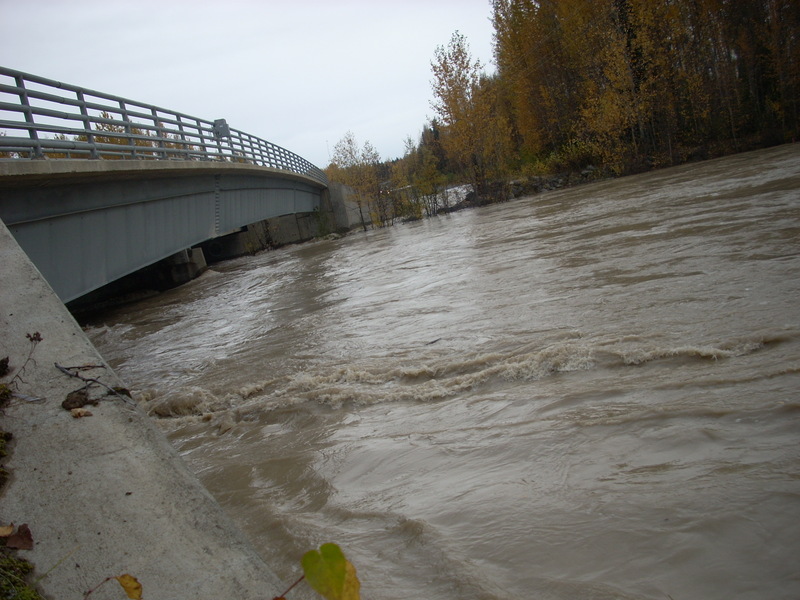 Wednesday, September 19, I had a busy schedule, made more interesting by some rather dire weather forecasts at my destinations of Anchorage and Cordova – high wind and flood advisories. I actually tried to get on an earlier flight Tuesday evening, but no go. 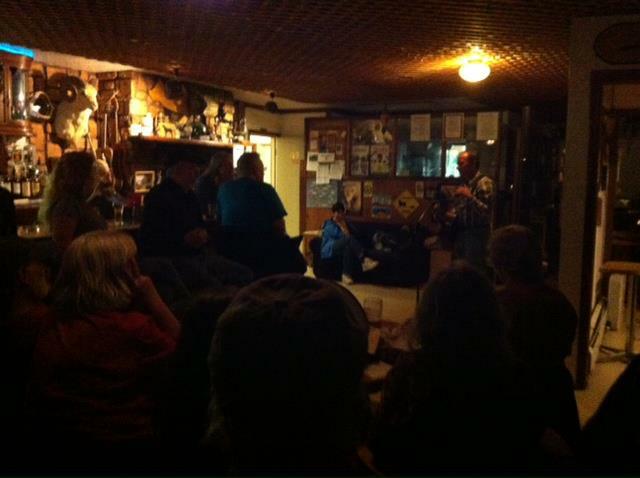 So I attended a great honky-tonk/bluegrass jam at the Alaskan Bar in Juneau instead. What fun! I can’t recall everyone’s names, but we had a good session in the back room, known locally as the “bird room.” Up early on Wednesday, Lis McLaughlin drove me to the airport about 7 a.m. My flight to Anchorage departed on time, and I marveled at the rugged scenery below us. Here is a bird’s-eye view of a glacier. The weather became cloudy and blustery as we approached Anchorage. After some bouncing and maneuvering, we made a safe landing. Mike McCormick was there to meet me, and took me to breakfast at Gwennie’s. I had eggs and reindeer sausage. It was good, but more than I could eat. Portions (and prices!) up here are huge! 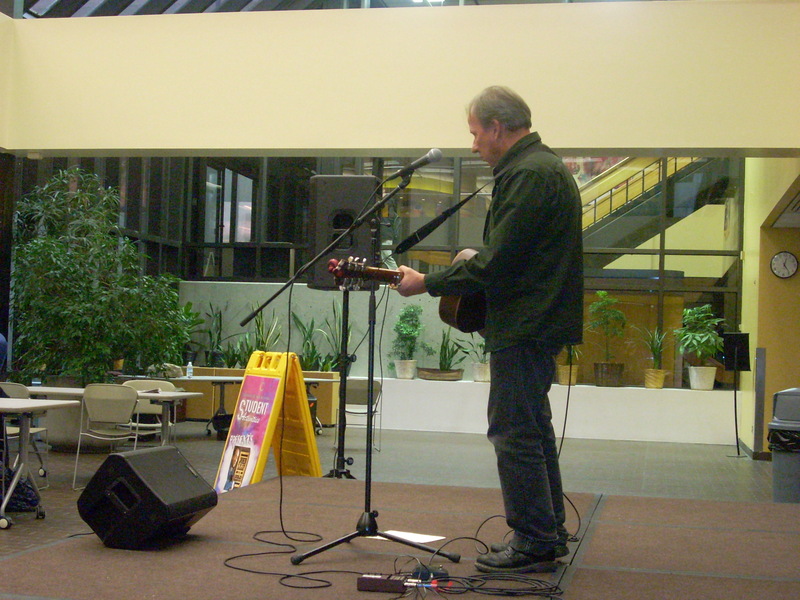 Mike took me to the University of Alaska/Anchorage, where I played a noontime gig in the student cafeteria. Not my usual venue, but it went fine. From the university, Mike drove me back to the airport to catch my 3:30 flight to Cordova. The flight was cancelled! Fortunately I was able to get booked on a later flight, which left around 7:00. 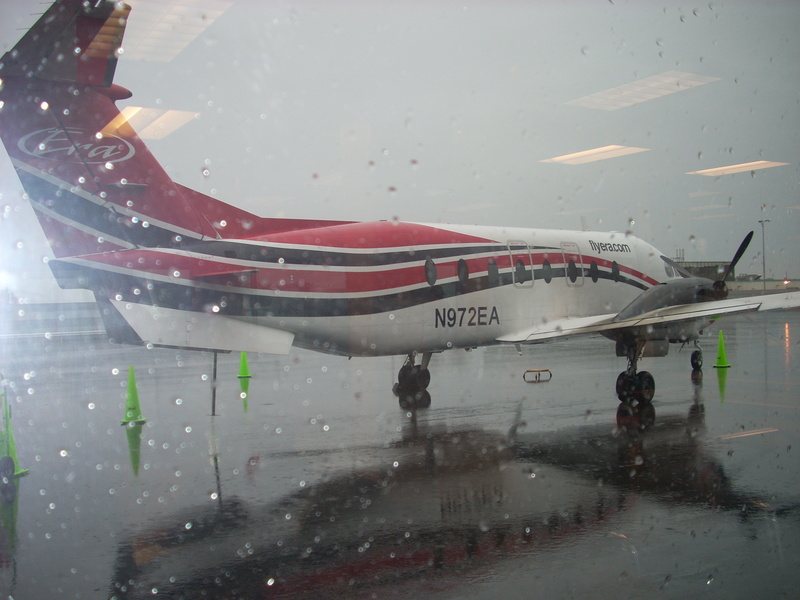 The conditions in Anchorage were windy and steady rain, and I worried about what it would be like to fly over Prince William Sound in a small twin-prop plane in such weather. Alaska people are hearty, however, and the pilots are used to this and worse. We took off as scheduled in a plane that held about 20 people. After a white-knuckle landing in Cordova, I battled a strong wind across the tarmac, where I was met by my hostesses, Paula Payne and Belle Mickelson. Belle drove me to the home of Frances Mallory, an 82-year-old piano player, who was hosting one of her regular jam sessions around her piano. It was a very sweet and old-fashioned scene, and quite a warm welcome to Cordova. I was immediately struck by how much Cordova reminds me of Shetland, another of my favorite places on earth. They are both remote seaboard towns with strong fishing industries and a deep love of music. And they both are pummeled constantly by high winds and rain! This current storm has dropped more than 20 inches of rain on Cordova in a week. 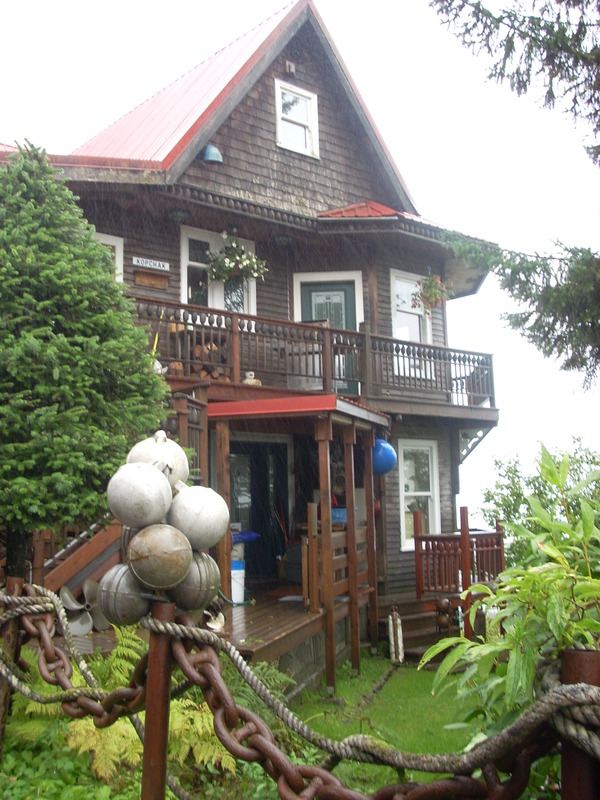 I stayed with two wonderful people, R.J. and Barclay Kopchak, in their majestic home overlooking the harbor. On Thursday, September 20, I was scheduled to do three school shows and an evening concert. I enjoyed visiting in the classroom with the high school and junior high band members, then did a full assembly program with the elementary and pre-school kids. During a brief respite from the storm, Barclay took me on a sight-seeing tour of greater metropolitan Cordova. It is quite beautiful, if somewhat waterlogged. 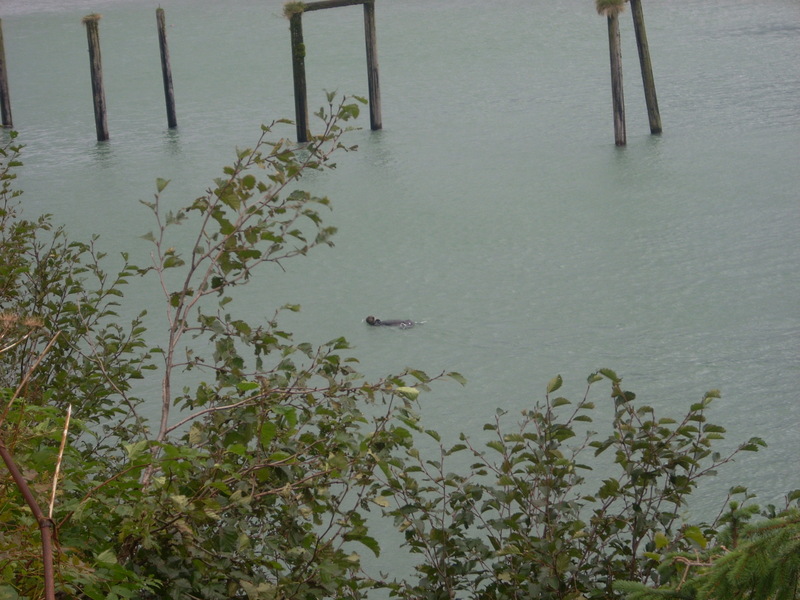 The highlight of the tour was witnessing dozens of sea otters playing and swimming in the tide. The are surprisingly large animals – up to 100 pounds – and have a buoyant air about them as they float on their backs with the heads and paws raised. They were difficult to photograph. My evening show was back at the elementary school. The rain drove against the window and the wind howled the entire time. In Alaska, it seems nature is always asserting itself. I think that is what draws people here, what aggravates them, and what commits them to staying. What a place! 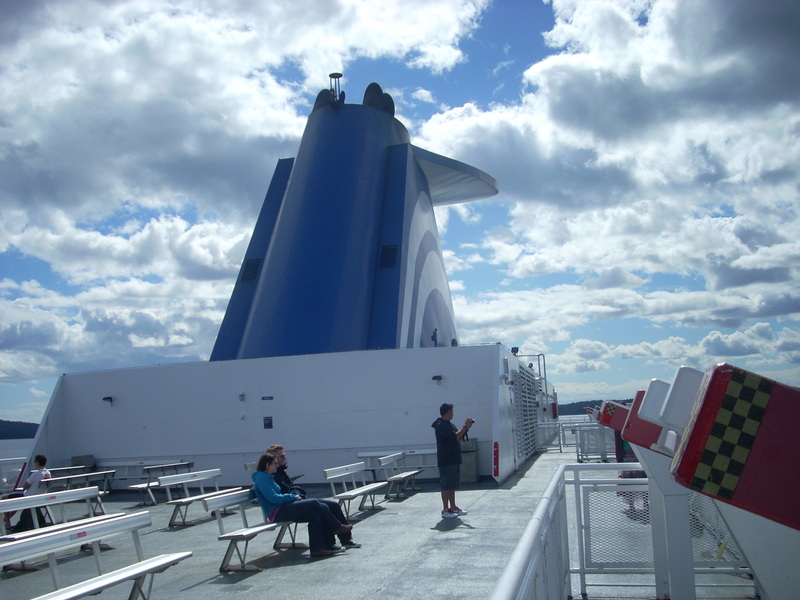 Saturday, September 15, started out early as Kathy Fanning and Sally Donaldson were kind enough to drive me to the ferry terminal at 6 a.m. Operating on only a few hours of sleep, I found a comfortable seat by the window and settled in for the four-hour trip to Haines. Following some fitful napping, I came to realize what a spectacular journey I was on. Alaska’s Inside Passage is a thing to behold – grey-green water, steep and rugged mountain sides, misty low-hanging clouds, islands, glaciers, and wildlife. The entire trip is a photo opportunity. Tom Heywood picked me up around noon as I landed in Haines. 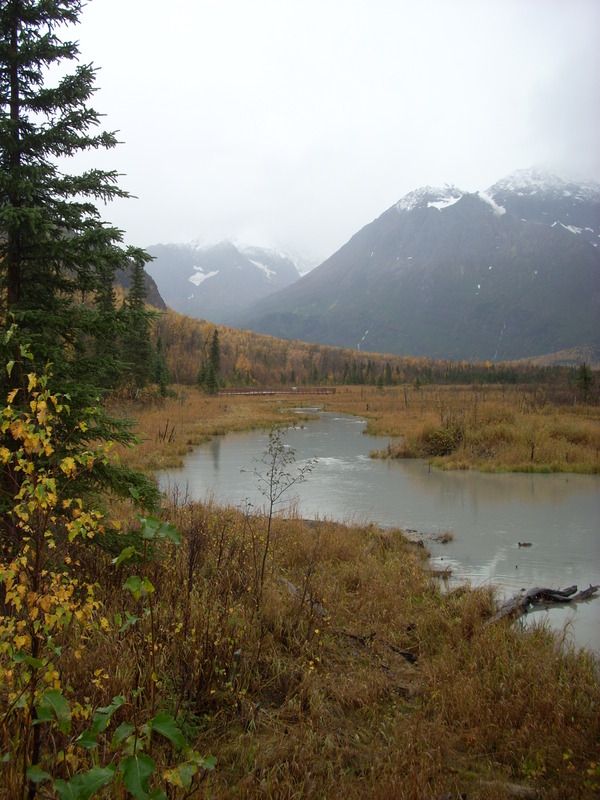 Tom took me to a river and lake where the salmon were running – this is what many people come to Alaska to find. We saw fishermen reeling in large fish almost as quickly as they could get their lines in the water. The salmon were jumping, which was very cool to see. 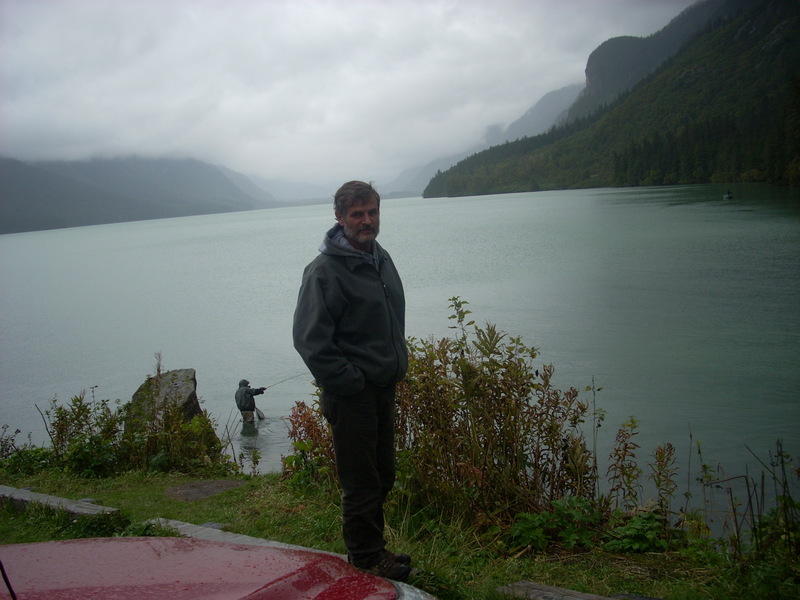 Tom posed for this picture with a fisherman and the lake visible over his shoulder. Tom told a dramatic story of ice skating on this lake one winter, when suddenly the ice gave way, and he found himself beneath the frozen water. It took all of his strength and determination to finally pull himself, soaking wet and exahausted, back onto the ice surface and skate back to his car. Quite an adventure! Haines is a town of about 3,500 people, located at the base of some huge, snowcapped mountains. The only way in or out appears to be by ferry or seaplane. 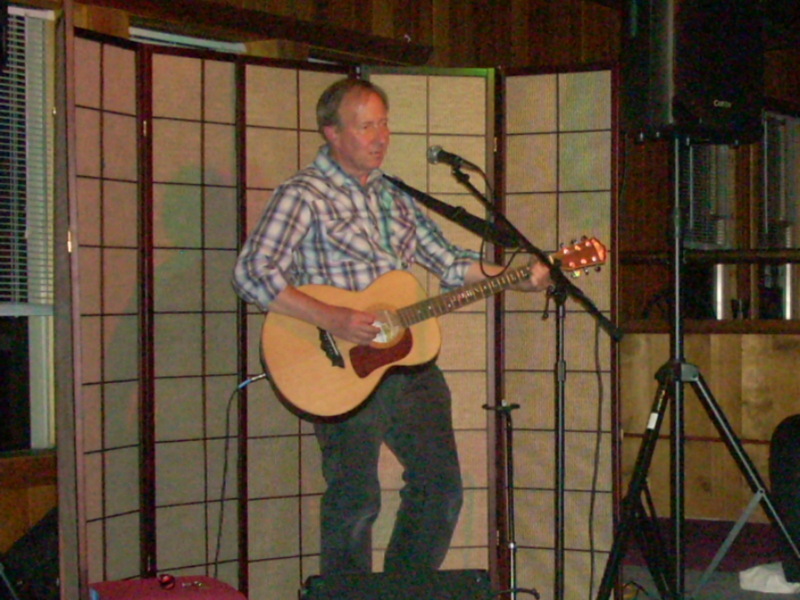 The concert that night was at the Chilkat Arts Center. It was probably the best show of the tour so far. Very appreciative audience, nice venue, brisk CD sales, and a pleasant get-together afterwards. 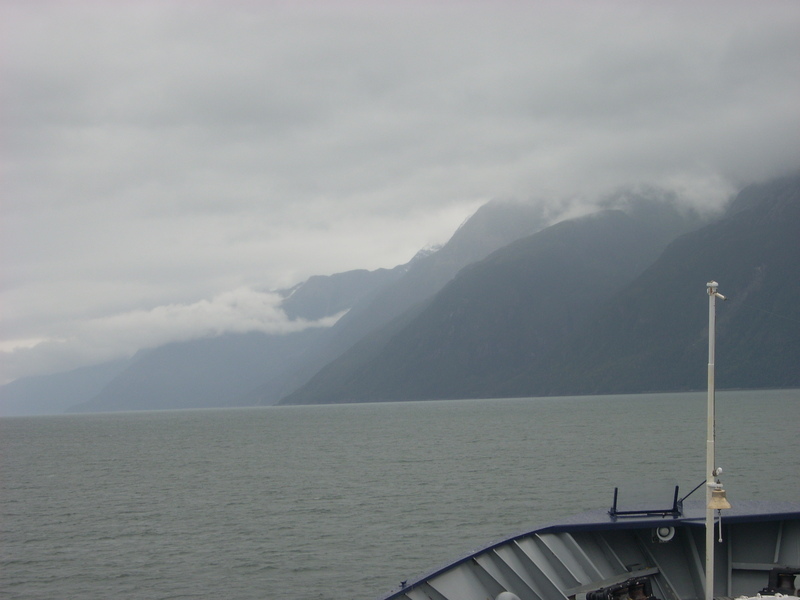 The next day, Sunday, September 16, I reboarded the ferry and took the short ride to Skagway, the northernmost point on the Inside Passage. The waterway becomes quite narrow toward the end, and the scenery even more spectacular. 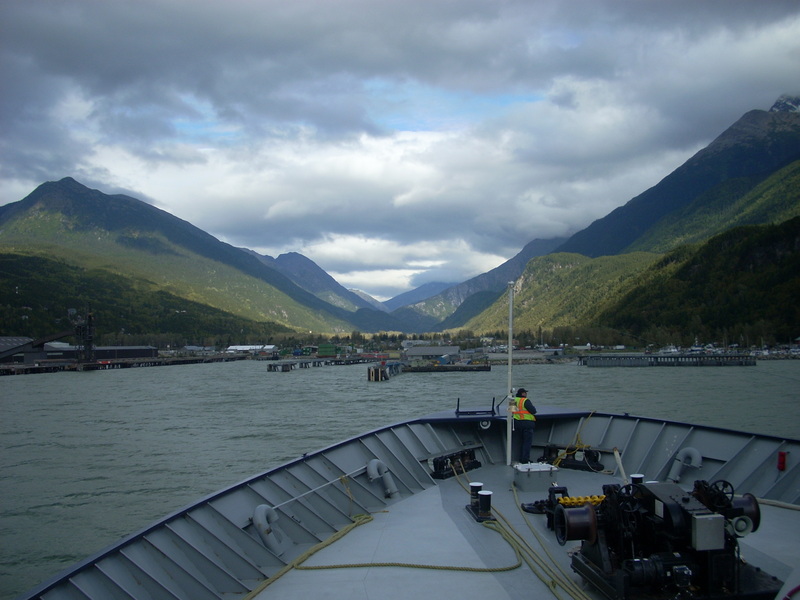 Here is the view coming into Skagway. 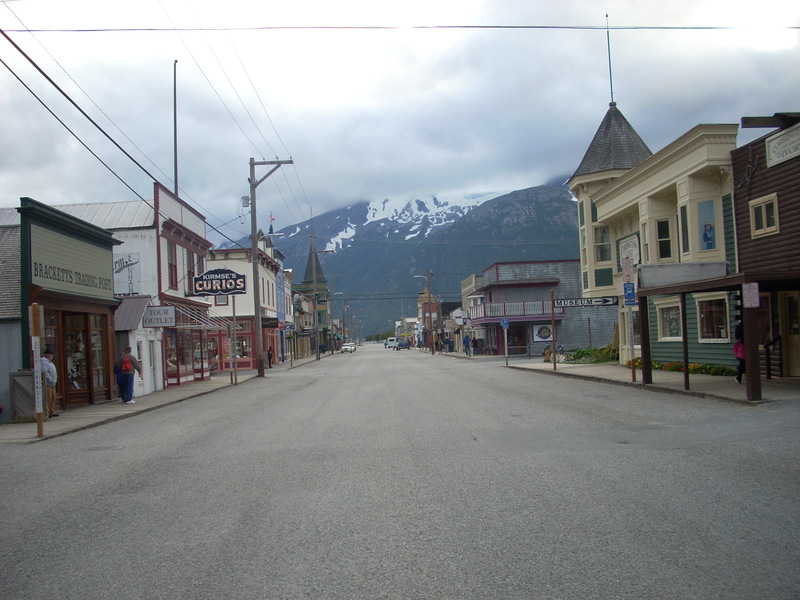 Skagway is quie different from Haines. Here they cater to a vibrant tourist trade, fueled by cruise ships that come here during the non-winter months. The stores sell gifts and souvenirs, and the downtown has a quaint, gold-rush look to it. The show is Skagway was held in an upstairs lounge at an old hotel downtown. The audience was a bit reserved, which I later found out is par for Skagway audiences. But they did enjoy the show, as did I. A couple of women, who call themselves the Hot Toddies, sang a few songs for me after the show. They were very good and a lot of fun! Keep an eye out for them. I had an early ferry to catch Monday morning. I dragged myself back onto the boat at 6 a.m. and tried to sleep. I had a six-hour ferry ride en route back to Juneau. We saw some orca whales! 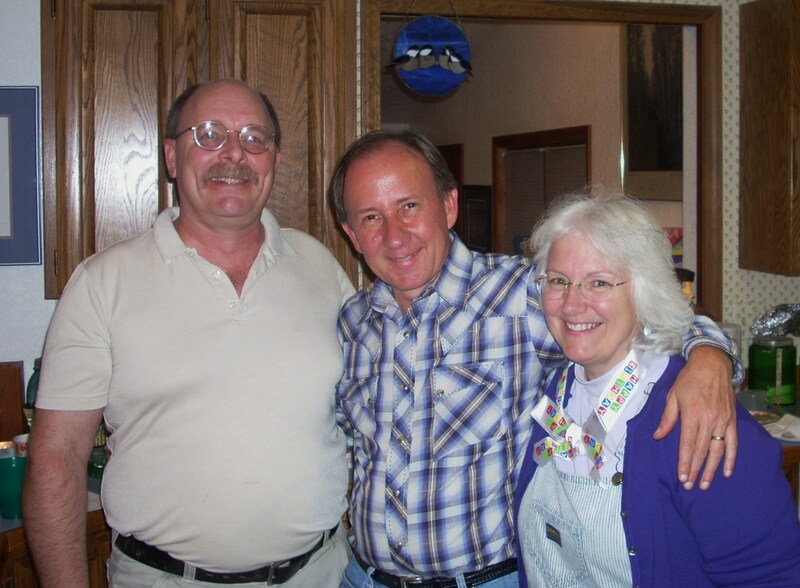 Back in Juneau, I stayed with Lis and Greg McLaughlin, old friends from my 1990 visit to the Alaska Folk Festival. A highlight of the afternoon was visiting Joanie Deering at her Paradise (?) Cafe in downtown Juneau. Her daughter is Lahna Deering of the wonderful blues duo Deering & Down – another act to look out for. Joanie fed me lunch, including a bicycle-powered friut smoothy, which I blended myself on a specially fitted bicycle. You had to be there… That evening we had music at Lis and Greg’s house. Juneau has treated me well! Thursday, September 12, was an ambitious travel day. My itinerary had me leaving Vancouver, BC, for Seattle in the morning. 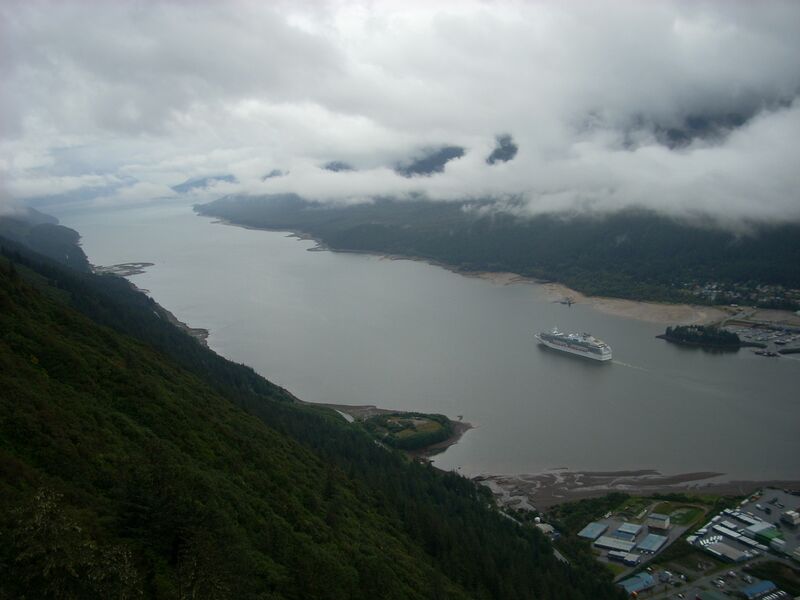 Following a considerable layover, it was on to Ketchikan, Sitka and Juneau, Alaska. Well, things went fine up until it came time to land in Ketchikan. We ran into some turbulence that had me gripping the seat. 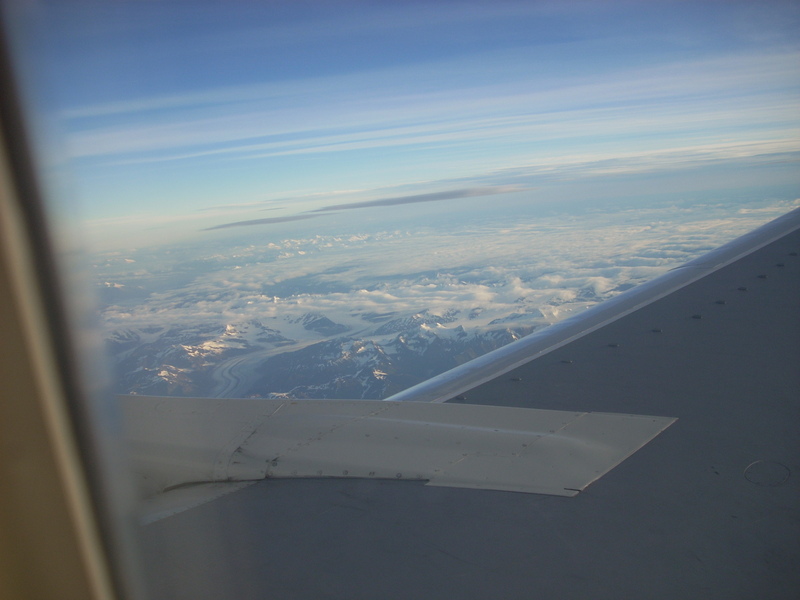 We were fairly low in the air – I could see the hillsides leading up to the airport through the plane windows. The plane was bouncing and jerking all over the place. I was quite unnerved, and very relieved when the pilot pulled up and gave up on landing. He later came on the speaker and explained that we had experienced a “wind shear event,” and that we would be proceeding on to Sitka. The Ketchikan passengers filed off the plane there to figure out how to get where they were going while I stayed on board, pleased to have an uneventful trip the rest of the way to Juneau. I was met at the airport by Kathy Fanning and Sally Donaldson, who took me to the Donaldson home where I would be staying. They had a chicken dinner waiting for me. Dave Donaldson, a local public radio reporter, carved the bird and joined us for the meal. I played a few songs for my hosts after we ate. 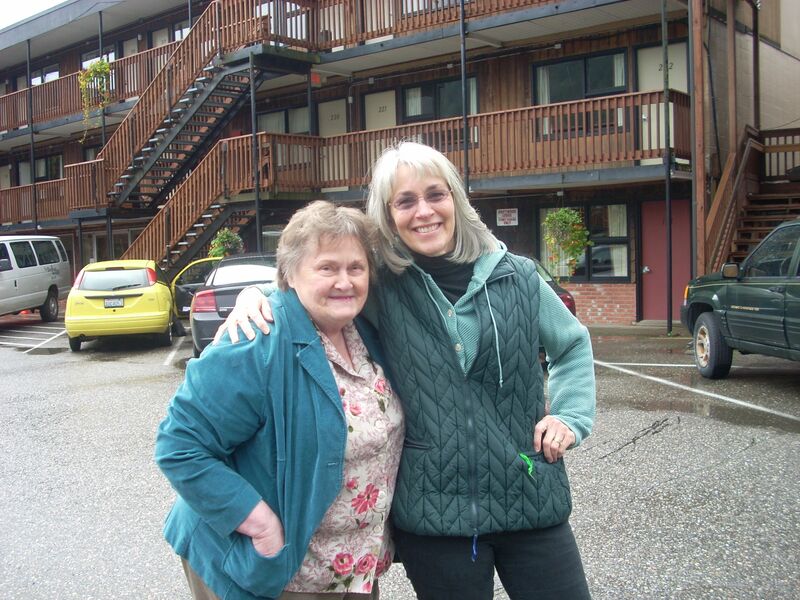 Kathy Fanning and Elva Bontrager took me around town on Friday. 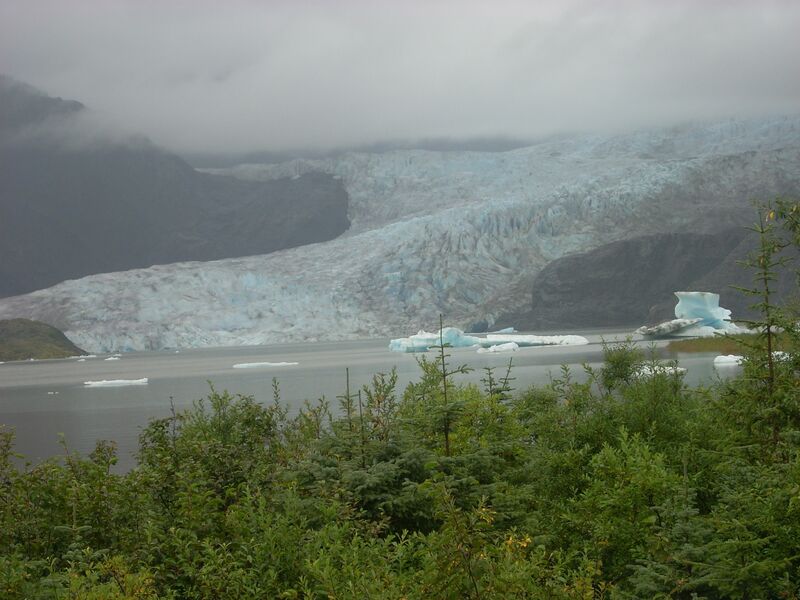 We visited several tourist-worthy sights, including the Mendenhall Glacier. While driving up to the glacier we saw some bears! After a radio interview on KTOO radio, we took the Mount Rogers Tram to the top of the mountain, where the gig was to be held, as part of the seventh annual Mountain Music Festival. The view of Juneau from the tram was spectacular! Perched on top of a steep mountain was a theater, restaurant, raptor rescue facility, and gift shop. 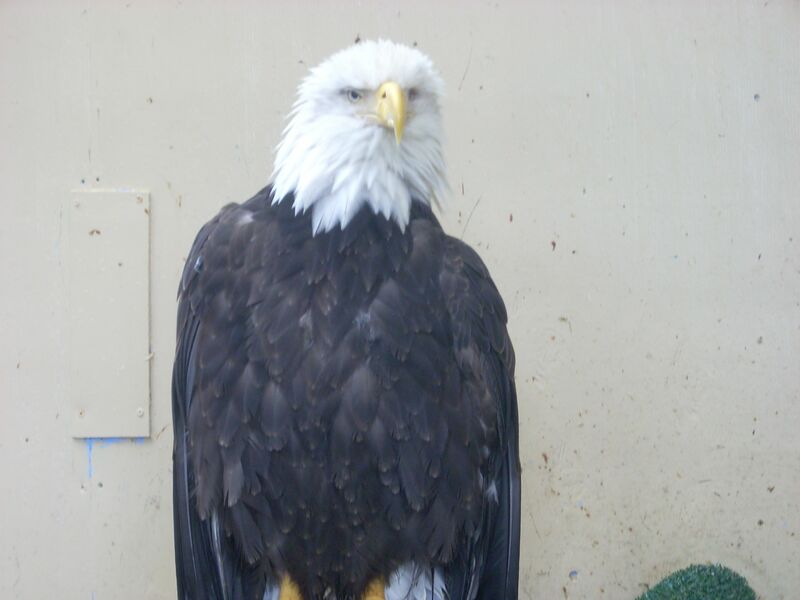 Bald eagles are common here, and one was available for snapshots. Several other musicians performed, some before me, some after me. I was the “feature” performer, and got a longer time slot than the others. My set went very well. This was a unique and enjoyable gig. Tomorrow, on to Haines! After hard-nosing the highway for several days, it was nice to land at my brother’s house in Vancouver for a couple days of rest before heading up to Alaska and what promises to be a fairly hectic schedule later this week. 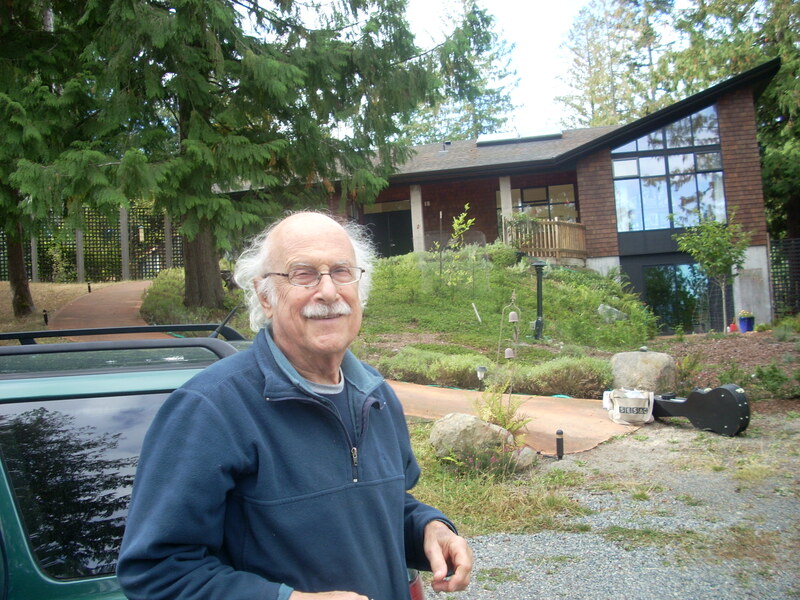 Peter Sussman drove me to Victoria, BC, where I caught a bus. The bus took me to the Vancouver ferry, which was a huge boat – the bus simply drove into the hold along with several other buses and at least a dozen semi trucks. Victoria is the capital of British Columbia, and people travel this route between there and Vancouver on a regular basis. I found it impressive and fascinating. At the Vancouver shore, the bus simply drove off the other end of the boat and continued driving into the city. My brother Bob picked me up and we went to his home. 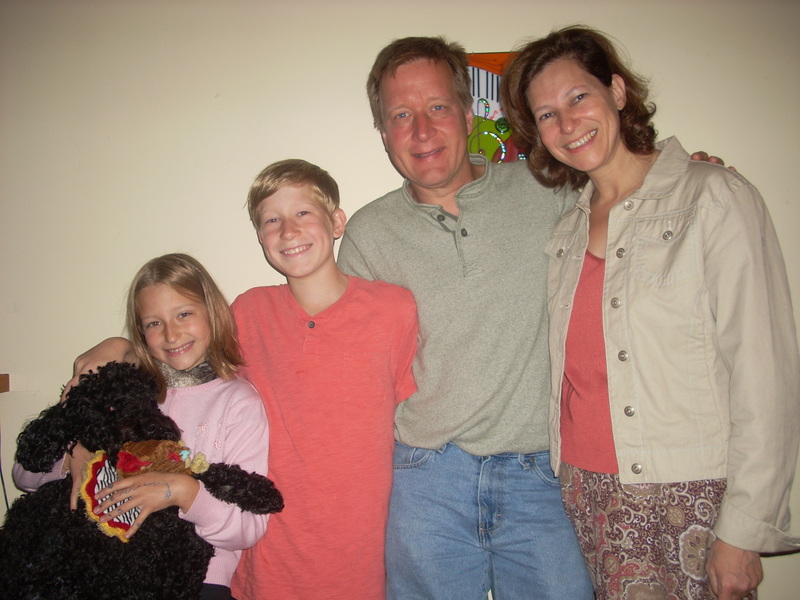 Bob and his wife, Veronica, live with their two very cool kids, Drew and Maddy, and their curly-headed dog, Buddy. 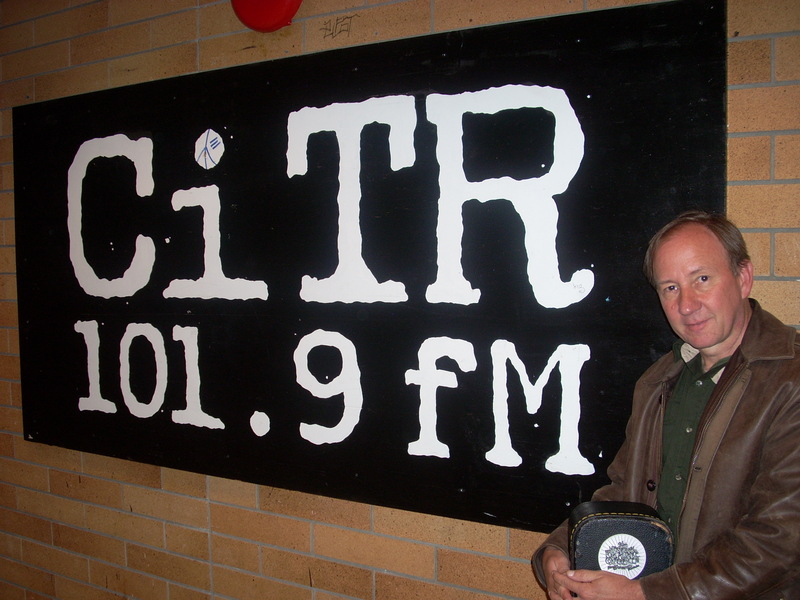 After a relaxing visit on Monday evening, Bob and I got up before dawn on Tuesday and headed to the radio station CiTR on the campus of the University of British Columbia. I was the guest of Arthur and Andrea Berman on their 6-8 a.m. Pacific Pickin’ program. Bob and I spent Tuesday afternoon being tourists, which is really easy to do in Vancouver. This has to be one of the most beautiful cities in the world. The parks and residential areas are lush and manicured, everything is well-kept and attractive. And the setting, between snow-capped peaks and the blue sea, is idyllic. 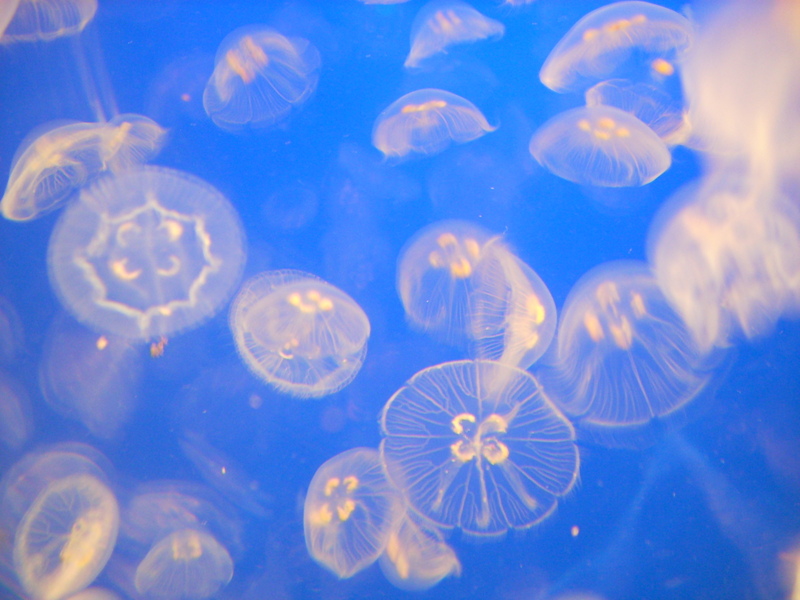 We spent a good bit of the afternoon at the Vancouver Aquarium and saw a lot of critters. Wednesday was my day to get caught up on laundry, postcards, changing guitar strings, and preparing for my evening concert. Bob and I took a nice bike ride through the Endowment Lands, a spectacular forest area near the university campus. 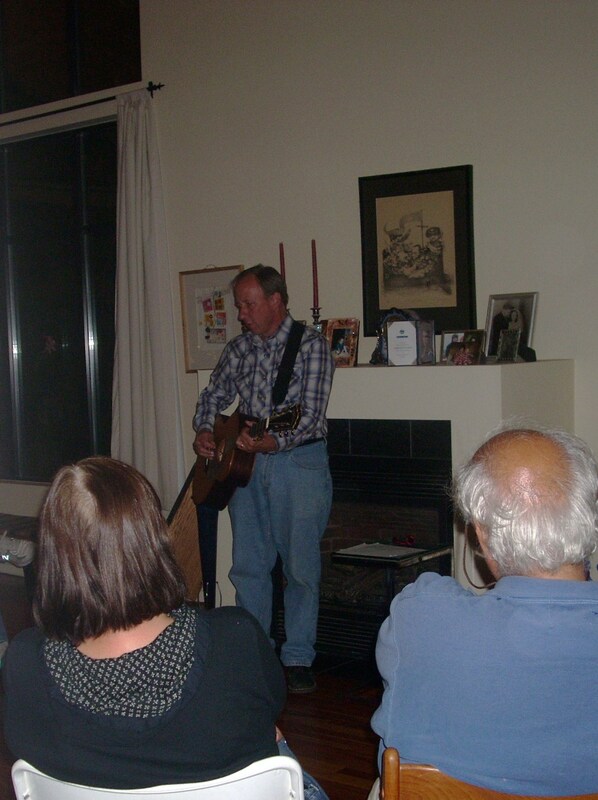 My concert was at the beautiful home of Doug and Lorraine O’Neill. What a great venue! Wonderful people, well organized, even had a small stage, sound system and lights. A good night, to be sure. I’m now rested, laundered, and ready for Alaska! Last Sunday, September 9, was a crazy day. Waking up in Forget, Saskatchewan, I was treated to a generous breakfast by my hosts, Don and Shannon. I got back in my rental car and drove back across the prairie toward Regina, sorry to leave Forget. Perhaps because it was Sunday morning, I did not see much harvesting activity, but I did pause to grab a few pictures of some of the weather-worn structures I passed along the way. I arrived at the Regina airport, returned my rental car, and caught my plane to Vancouver. As much as I looked forward to the next leg of my trip, I was a little sad to leave the prairie behind. The flight westward was uneventful, mostly cloudy outside. As we neared our destination, several huge mountain peaks protruded above the clouds. My brother Bob and his two kids, Drew and Maddy, met me at the airport and whisked me off to the harbor (or harbour, as they spell it here) where I caught a float plane to Vancouver Island. 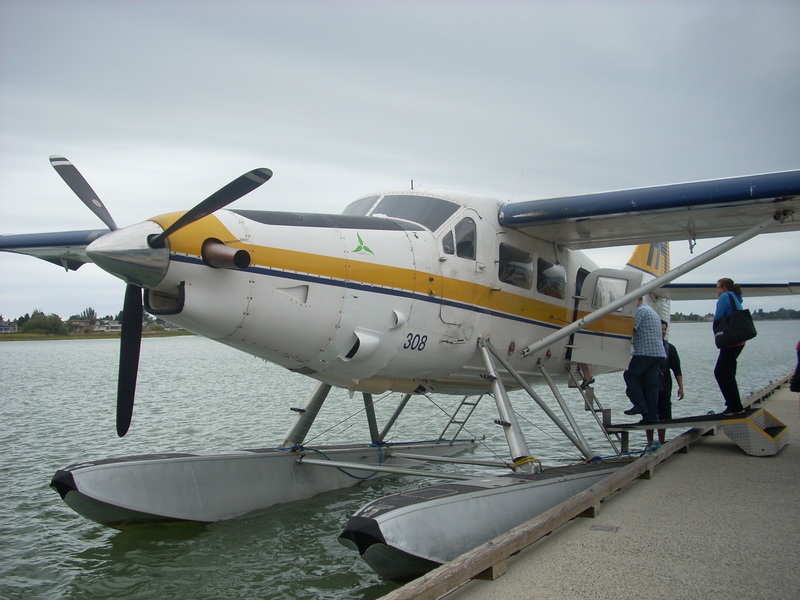 If you ever get the chance to take a float plane, definitely do! The experience of taking off and landing on the water, as well as flying across the waves at a very low altitude, is something to remember! I landed on Vancouver Island in the city of Nanaimo, where I was met by Doug and Joyce DeProy, who drove me an hour south to my destination at Mill Bay. Doug and Joyce have lived on the island for 20 years, or so, and provided a colorful commentary as we traveled. Vancouver Island is enormous – 350 miles long and about 25 miles across. It is filled with towering trees and steep hills, lovely towns and well-kept houses. As much as I enjoyed my travels, I was a little spent by the time we got to where we were going, but I managed to rally in time for the evening concert. 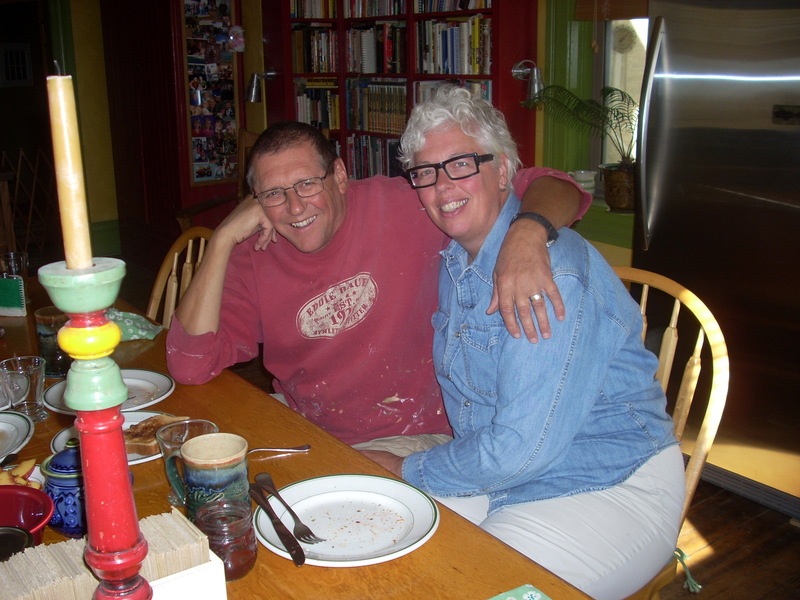 My host was Peter Sussman, and his wife, Barbara. They are both retired psychologists, who met in West Virginia in the 1970’s, or possibly the late ’60’s. They are free thinkers and die-hard humanitarians in the best sense. Old hippies. I love old hippies! Here is Peter and the house he helped design and build. 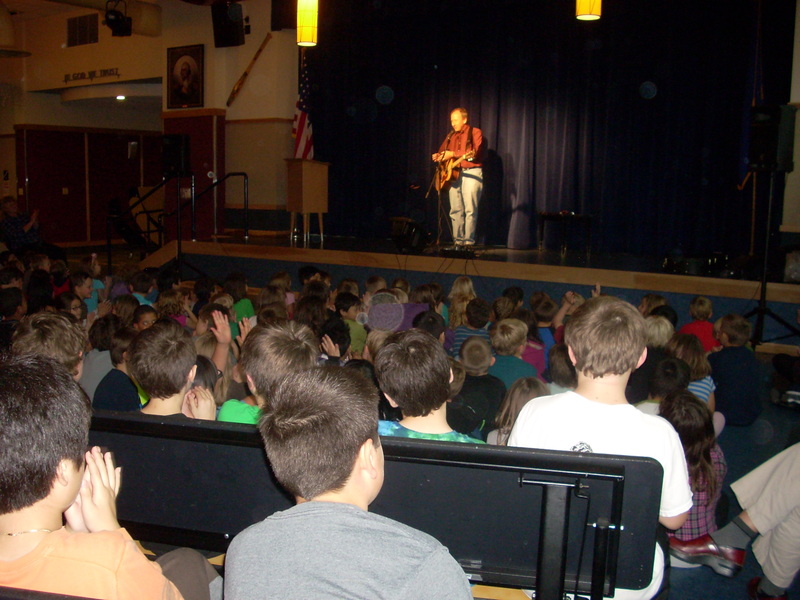 This was a fairly small concert, but the audience was very attentive and interested in what I had to offer. 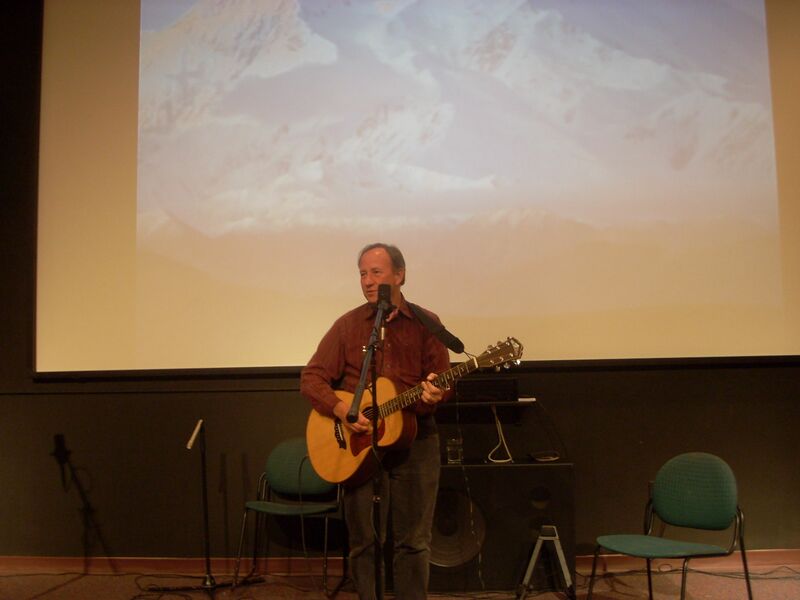 Peter stressed my West Virginia connections during his introduction, so I varied my set and included the “West Virginia Hills,” “West Virginia, My Home,” and several other songs related to the state and Appalachian region. It went well, but I was exhausted by the end of the show. Tired, but smiling. 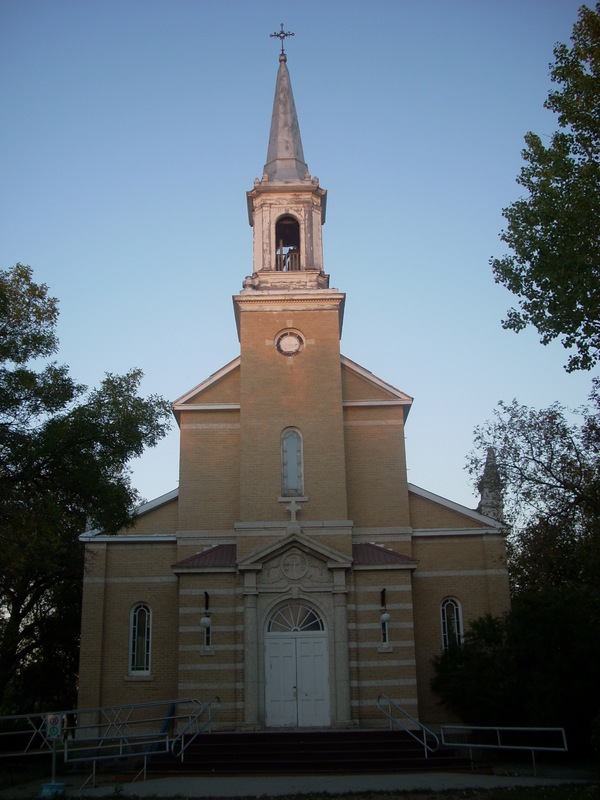 Forget (say four-zhay) is a small town in southern Saskatchewan. I’m talking population 38 people, if everyone is home. Might seem like an unlikely place for a gig, but that’s where I played last Saturday night. It was great! I started the day in Regina, the capital of Saskatchewan, where I had played Friday night. My hostess, Brenda Tacik, invited me to cohost her radio show on CJTR radio. 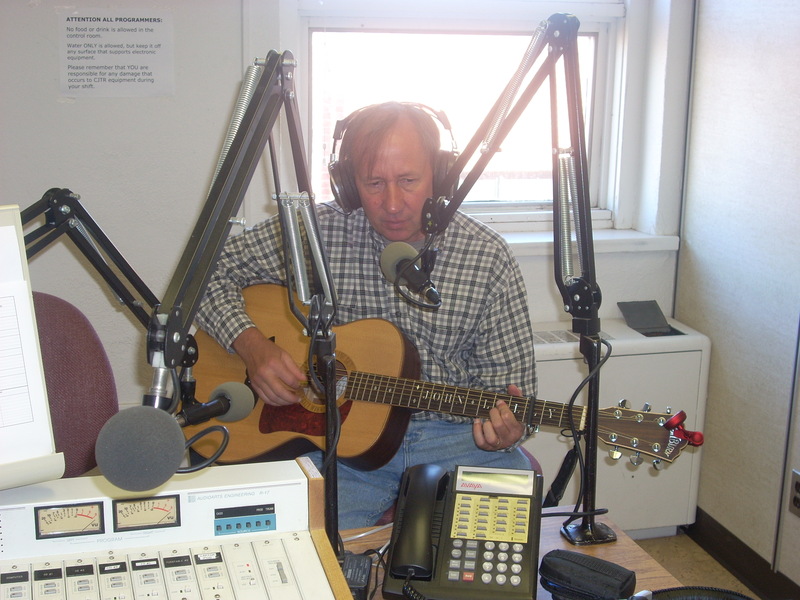 It was fun to be back on the air waves, and to play a few tunes “live” in the studio. Leaving the radio station I drove to a big farm supply/western wear shop called Cowtown, where I picking up a sharp new shirt. Then I began my three-hour drive southeast to Forget. 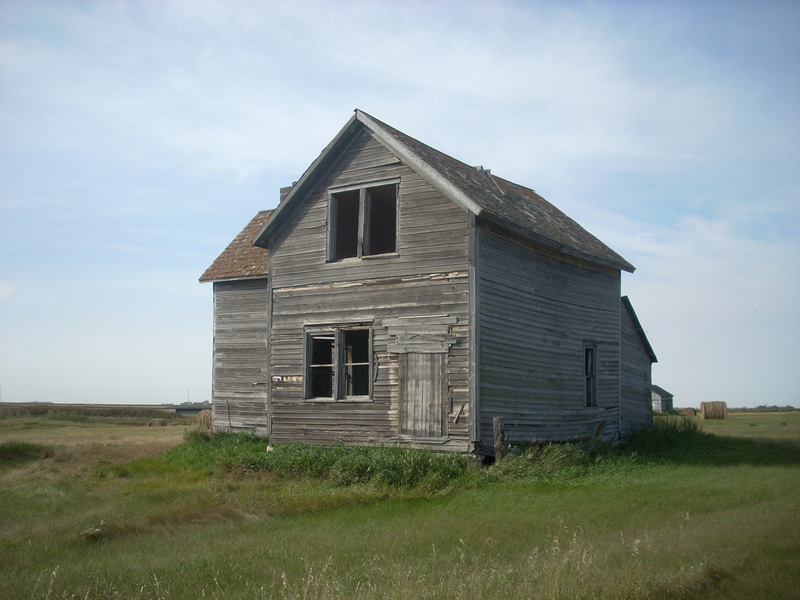 Did I mention that Saskatchewan is flat and rural? The sky is huge, the horizon continuous. It is vast and magestic. It is also subtle and delicate, with different crops and weeds showing various shades of gold, red and yellow. 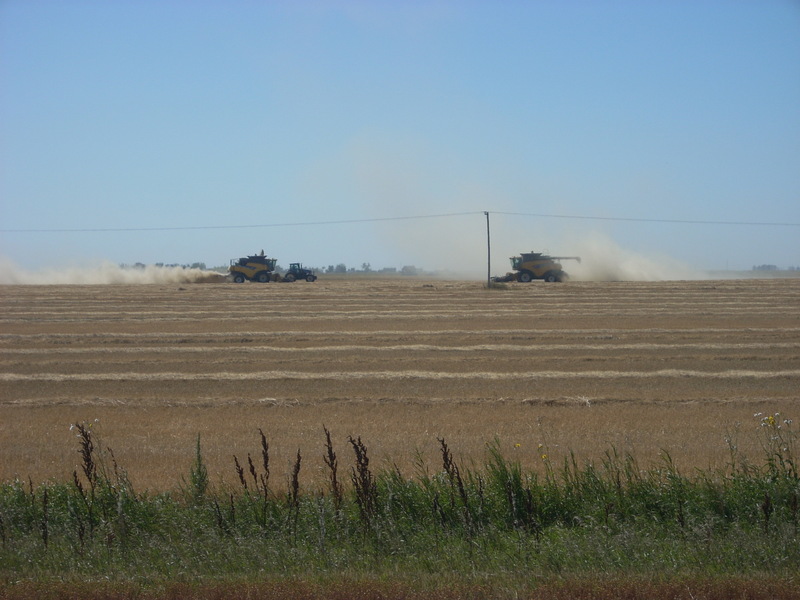 Now is harvest time, and I was excited to see huge farm machines chugging and churning across the prairie. Owners Don and Shannon, and their friend Kerstin, were on the desk eating friut and cheese and soaking up the sunshine, waiting for me. I enjoyed visiting with them and getting some background on this unusual town. At one time, Forget held more than 600 souls, including two dozen nuns and a dozen priests, who lived in a convent and rectory next door to the church. Don and Shannon have converted the rectory into a bed and breakfast inn, which is where I stayed. The church still holds a congregation of about 50. Don and Shannon moved here several years ago and have turned this once-moribund hamlet into a thriving arts center. 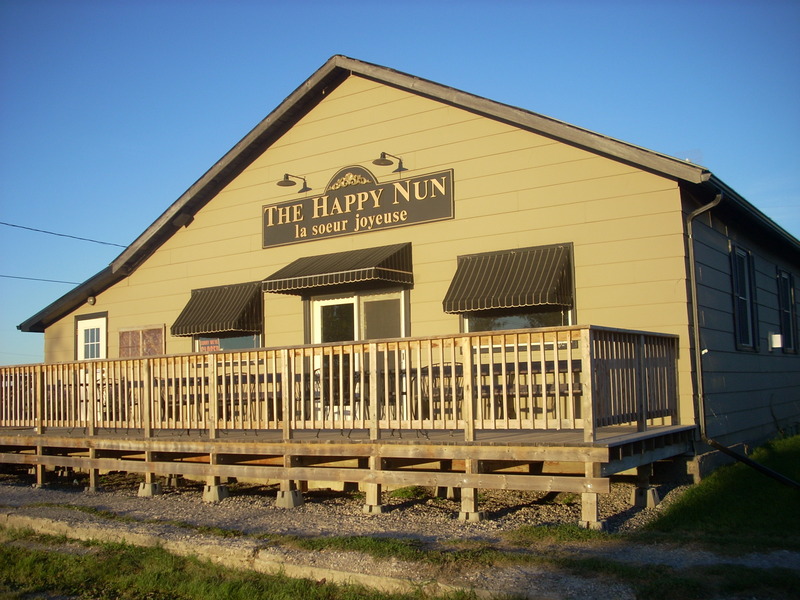 In addition to the cafe and B&B, they have an artists’ workshop, piano studio, apiary, and concert series. 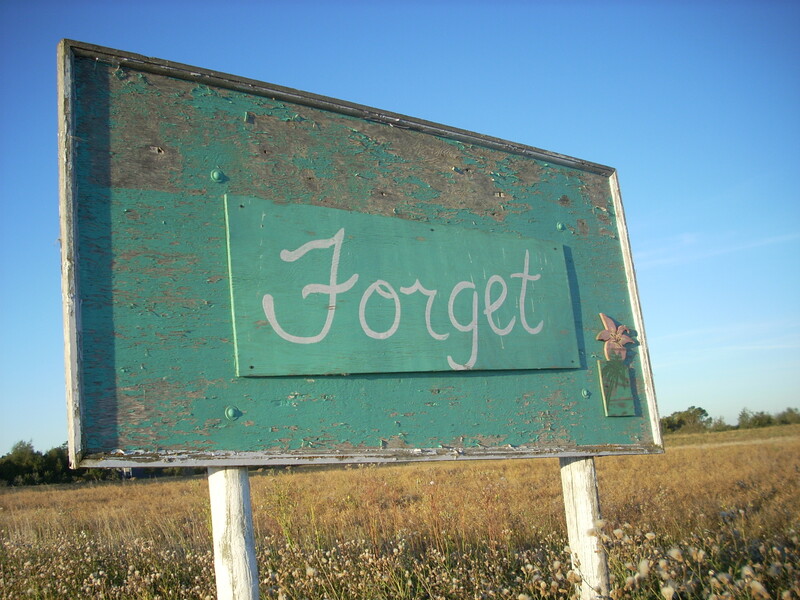 Joining them in Forget are a furniture maker, violin teacher, music store and recording studio. What a place! Here are Don and Shannon. The concert was a lot of fun, though the audience made me nervous with how quiet and attentive they were. They truly enjoyed the music, however, and I truly will not forget Forget!